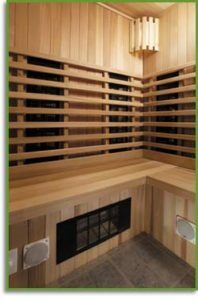 Alpine Sauna and Steam, known as a world leader in saunas and steambaths, is also a world leader in infrared heat therapy rooms. Not to be confused with saunas, infrared rooms offer their own unique features and benefits. Infrared is perfect as a "heat therapy room," for athletes looking for a pre-workout warm-up – to warm up muscles and increase flexibility, helping to prevent injury. It's also ideal for warm-up for physical therapy and massage therapy. What is an Infrared Heat Therapy Room? An infrared heat therapy room provides soothing heat, directly radiated to the body, with very little time waiting for preheating. Our infrared rooms and infrared heaters are proudly manufactured in our Minnesota facility. The amount and positioning of the heat source is specially harmonized to the particular infrared room's design and size. The heat radiates in a wide angle from each heater so the heat is spread evenly within the cabin space.